A single legendary warrior is known for the ability to keep balance and skilled in the art of hiding; the warrior of the shade climbs the walls and roofs and no one can see the end of his trace. The mission of the warrior is to start the way and come to the end unnoticed. Ninja warrior is the mercenary in medieval Japan who is engaged in espionage activity, sabotage and murders. First ninja warriors appeared 900 years ago. They were against the ancient class of samurais who failed to adhere to the samurai code of honor. Those ninja warriors were involved in mean deeds as thefts, murders and espionages not so favored and appreciated by the samurai warriors. According to ancient myths the shinobi were courageous and perfectly trained-trained warriors who were trained in ninjutsu art from early age. They had to be skilled in many schools and traditions to be deemed as qualified ninja. The shadow warrior was supposed to master any kind of weapon; he had to be skilled in making any item in hands to a weapon; he had to be a master to oppose any kinds of weapon used by the enemy, own the art of personal combat, appear and disappear suddenly, be qualified in knowing the territory. He was supposed to be able to run for long distances, crawl and climb mountains. As for additional skills, Ninja was believed to master some certain medical sciences and set disjunctions, know basics of acupuncture, local medical traditions and herbal therapy. On the top of it, shinobi were good at having the twilight vision, they had perfect sense of hearing and smelling. Ninja were known to have a good eye memory which was of high value for ninja as a warrior. Ninja warrior had never specified gender issues and both male and female warriors could perform well. Female ninja warriors were also called kunoichi. Often samurais (or ronins) who lost their masters joined Ninja warriors. The most influential ninjutsu schools were Koga-ryu and Iga-ryu. 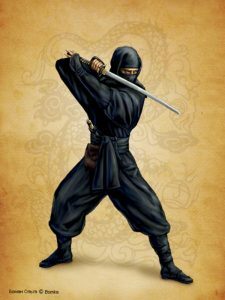 Ninja were also called invisible people, demons of night or shadow warriors for their capacity to remain invisible, bypass the enemy without engaging in a battle. However, if they had to fight for any reason, that battle was too short and merciless. Moreover, the enemies were not killed to death but only their extremities were injured or damage to prevent from further fighting. This helped to keep to the mystery of their Ninja organization. 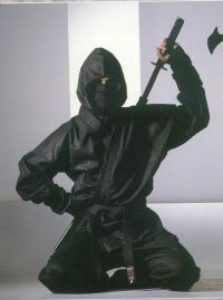 In most Japanese legends and myths ninja warriors are opposed to samurais and that is not just for comparison purposes. The formation of samurai class developed along with the formation of ninja class. By virtue of the more power and influence the samurai class was rather dominating while the ninja class (the word “nin” stands for the secret or mysterious and “shinobi” is another term for it) became conspiratorial as the spy agency should do. According to ninjutsu philosophy no obvious force is allowed to show. Terrorizing samurais and feudal lords, the demons of night never affected peasants as the latters could always render assistance to them. Ninja could travel throughout the country pretending to be a peasant, a merchant or a monk-hermit without arousing suspicion while freely moving around. The training program included a study of Japanese culture; in addition to the art of espionage, ninja had their major specialty – some of them were craftsmen, someone — a carpenter; some of them mastered the art of tea ceremony and various Japanese rituals. This was useful to be close to people and remain ordinary. Ninja was like an expensive piece of retail goods and they were mainly hired to steal various essential documents, to perform sabotage or commit an assassination of major officials. Ninja might not be the fastest and the most powerful warriors, but they are likely the most dangerous ones.